Grocery stores of any size can benefit from the use of self-service coin counters. These machines present a valuable asset for the community by giving customers the chance to properly exchange their loose change into something more manageable, such as cash or gift cards. This is especially important with small box supermarkets that are a new trend in the grocery business. As these stores become smaller, there's a greater sense of camaraderie for residents in the area; the size creates a more intimate and relatable shopping experience. The counters can make that process more ideal because practically everyone ends up with some amount of loose or collected change . Small-format supermarkets are markedly smaller in area than the average supermarket size of 45,000 square feet. Many of these smaller locations, also known as small box grocery stores, can fit in much tighter locations. Areas that may be underserved by grocers due to population density and extensive development can benefit from these stores, which have some resemblance to supermarkets found in Europe. It certainly helps that many of the supermarket chains pushing these stores forward happen to have connections to the European market. Hannaford, an American subsidiary of Belgian supermarket conglomerate Delhaize, is experimenting with the small box concept with a new store that opened in early August 2015. The store, located in North Berwick, Maine, near the company's headquarters in Scarborough, is less than half the size of standard Hannaford stores. Still, it possesses many of the amenities found in larger supermarkets such as a walk-in beer cooler, produce, frozen foods, organic and gluten-free sections and many more. Hannaford CEO Kevin Holt suggested to Supermarket News that the concept has potential. "We think that for fill-in sites, it works pretty well," Holt said. "We also think there can be a design standard around 20,000 feet that can be pretty productive. You see a lot in the marketplace today with stores like [Sprouts] and The Fresh Market." With such a concept, there is a great chance that other amenities will be necessary to fill in gaps concerning customer needs. One is the area of loose change. As banks become less interested in converting coins to cash, grocery stores can step in to fill the gap with self-service coin counters. 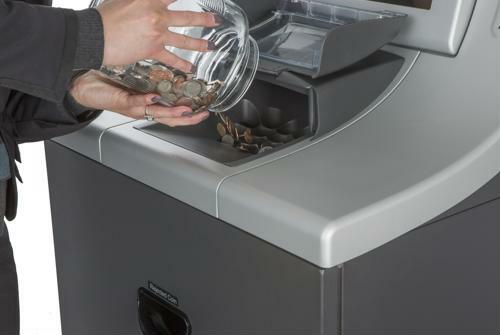 Their touchscreen-based design makes them easy to use, and they're efficient at counting even large jars filled with pennies, dimes and nickels.